We want to highlight a couple of the upcoming new features in Themes coming to Cyanogen OS 12. With the upcoming OS 12 update, users will be able to take advantage of App Themer and paid themes, among a number of other enhancements to the app. App Themer presents the user with a floating button that sits on top of your current app. You simply have to tap it to change the theme for that app. Theming an app with App Themer is as easy as one, two, three. 1. Tap on the App Themer icon found at the bottom of the Theme Chooser. This will bring up the floating paintbrush button. 2. Navigate to the app you want to theme. 3. Tap the paintbrush button and select the theme to apply to your app. You can theme as many apps as you want while the floating App Themer icon is on the screen. When you’re done theming your apps, simply drag the App Themer paintbrush down to the ‘X’ at the bottom of the screen and let go. App Themer is the perfect tool for all you advanced theme users as well as casual users who merely want to theme an individual app or two. App Themer also comes in handy when your favorite theme doesn’t look quite right for a particular app. You no longer need to change your entire theme just because of one app. Instead, you can simply change the theme for that individual app and continue to enjoy your favorite theme everywhere else. Cyanogen users will be able to take advantage of this handy new feature in the upcoming Cyanogen OS 12 ‘L’ OTA update as well as on future commercial devices that ship with Cyanogen OS. 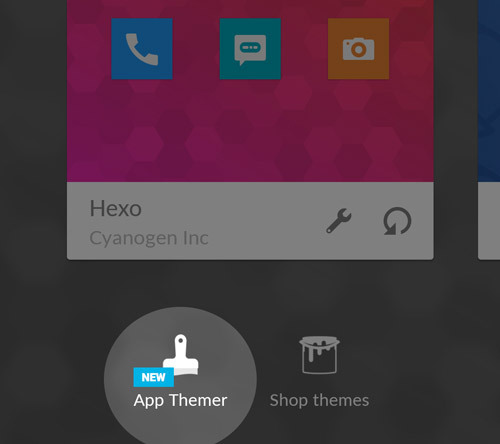 In other theme news, paid themes will be supported on Cyanogen OS 12. To access the paid themes make sure you have a Google Play account. Our Themes product team has been hard at work adding new features and making adjustments based on feedback from our community. We know that one of the top requested features is paid themes. Cyanogen OS users will be able to download a variety of high quality free and paid themes using the updated Themes app on OS 12.